It is slated to be a sweltering 90 degree day, plenty of sun, light winds and muggy. We moved into position at 6:30AM under our new “bimini shades”, glad to know that we will no longer be scorched by the sun. The line of cruisers had started. We are all headed in the same direction. North. The start of the day will be a 15 mile land cut between the Pungo and Alligator River. When you look at the map – it seems that Cat Maudy has sprung wheels and is traveling on land. I can assure you this is not the case. We are still floating. It is just along a narrow land cut lined on either side with exposed tree stumps. Avoid the tree stumps at all costs. More ideas for our evolving Cruisers Challenge board game! We creep up to the short Wilkerson Bridge. Why this bridge was built at 64′ instead of the standard 65′ feet is anybody’s guess. In any event, I have my Stanley electronic measuring stick poised and ready. The water levels appear low. How do I know this? I stare at the grasses along the banks of the channel…and look for the transition from green grass…to yellow…to exposed mud. If I see plenty of exposed mud – then the water levels are low. If I see only green grass, then the water levels are high. You are probably wishing you had this kind of excitement in your day. Surprise of all surprises. The Wilkerson Bridge now has a “measuring stick” (this was missing during our prior trip on the Inside Passage). The measuring stick next to the Wilkerson Bridge reveals 65 feet of clearance. Oh happy days! We creep up to her anyway – and clear with plenty of room. I put Stanley back into my pocket – glad to know he was not needed today. We have a light breeze – just enough to keep the bugs at bay. The land cut between the Pungo and Alligator Rivers is a breeding ground for bugs. The water is a chocolate brown, which we are told is due to the soil. Ok, I’ll buy that. The days of clear turquoise blue water found in South Florida are long gone. But there is plenty of life under the surface of the chocolate waters. We discovered this in our toilet bowl. Bear with me here. Boat toilets (heads) are designed to BRING IN outside water which is used to FILL the bowl. So, as I walked into the ‘head’ – and peeked into the bowl – little minnows were swimming. It’s a bit un-nerving seeing little fish swimming in your toilet bowl. We passed through our next 65′ fixed bridge with plenty of clearance – and are feeling mighty confident now about the water levels. Once on the Alligator River, we deviate slightly from our course to take a few shortcuts. One of our monohull traveling companions hails us to ask about the water depths. We report that the actual depths are higher than what is noted on the chart. And we don’t think much about this. There are light winds, enough to gain a few tenth’s of a knot by unfurling the jib – but not a lot of speed. We travel along the Albermarle Sound – a large shallow body of water that takes us to the North River. OK. Crab fishermen listen up. Would you like to save some money? I have a thought. Can you make the buoys a COLOR that we can see? Black, dark blue and dark green….NOT WORKING. We can’t see ’em. Orange, Red, Yellow….these are GOOD…we can see these. How does this save you money? If we can see them, we have a better chance of avoiding them. If we can’t see them….they get wrapped on our rudders and props….and we have to CUT the buoy from the crab pot in order to be set free. If you can’t find your buoy…then you can’t find your crabpot. All it takes is a BRIGHT COLORED BUOY – and you probably won’t lose as many crabpots as a result. Just a thought from a blonde boater. The fixed bridge in CoinJock NC – turned out to be the shortest we’ve encountered. It is 64.5 feet – but we clear it anyway. The higher water depths we noticed on the Alligator River…were a result of wind tides. Yes, the wind is light – but it has been blowing from the south for nearly a week. Apparently in some sections of the Inner Passage – it pushes the water levels higher….and in others – it is lower. Good luck trying to figure all of this out. 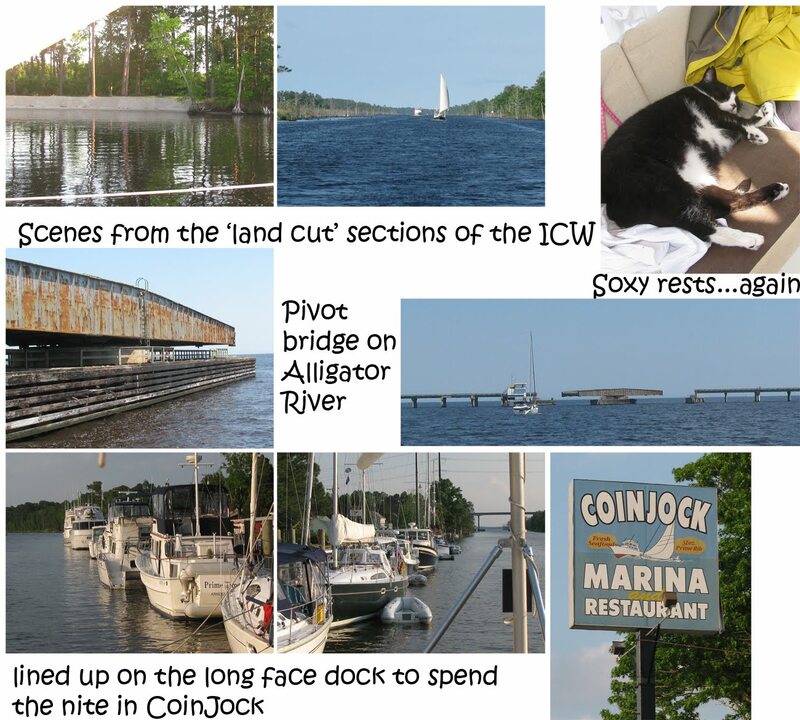 We arrived at the CoinJock Marina, along with our brigade of fellow cruisers at 4:30PM. The marina is one very long face dock on the ICW – and the marina folks try to fit you all in – in one big lineup. We race off the boat – and head straight to the air conditioned restaurant for a cool one. Two diet cokes and and hour of A/C – and we are fully recharged. 45 miles to go to Norfolk.